As a member of the exhibition industry I’m starting to feel like I have heard it all. I’ve sat through the sales pitches, taken notes from the speakers, analyzed the buzzwords and brainstormed to my heart’s content. When your days are filled trying to figure out new ways to inspire others, you sometimes have a tough time finding inspiration for yourself. 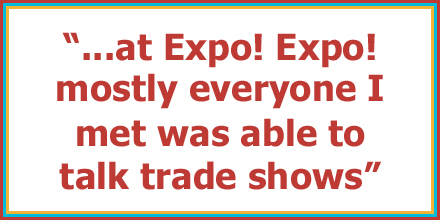 But in 2014 I was finally able to attend Expo! Expo! for the first time. During those three days in Los Angeles, I found myself inspired again. The experience began with the opening general session. Remarks from the mayor stirred a sense of importance, and pride in what I do. During the CEM presentation that pride was stirred again as I watched some of my friends cross the stage. I remembered my time in the program and how much it helped me to truly understand my industry and how to grow within it. Once the show floor opened I continued to find myself pleasantly surprised. I produce two annual trade shows, both of which are in fixed locations. I have attended other industry expos that are very destination-heavy, and felt as though there was not much for me. But Expo! Expo! was populated with a diverse roster of exhibitors. 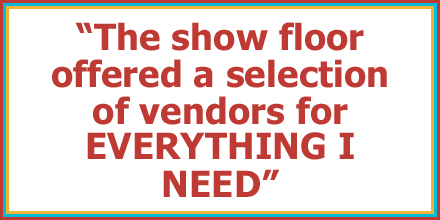 The show floor offered a selection of vendors for everything I need, from event essentials like registration and housing, to exhibitor services. I got to really experience the full attendee perspective as I walked the aisles, gathering information and exploring ideas. And as I reconnected with old vendors and introduced myself to new ones, I was reminded of the reasons WHY we produce trade shows. The education also provided a welcome experience. The sessions I attended were not only interesting, but relevant to current issues and initiatives within my association. The Swim-Up Tech Bar was especially intriguing with its abbreviated sessions hosted on the show floor. In addition to finding inspiration for my event, I left with a handful of personal takeaways and life-hacks that I continue to use today. But of course it’s the people that are paramount to the success of any trade show, and again, I was not disappointed. Too often I find myself the lone exhibitionist, in a room full of meeting planners. But at Expo! Expo! mostly everyone I met was able to talk trade shows. It was great to meet and mingle with so many like-minded peers. After the show ended, I returned home with excitement. I had a notebook full of ideas, and a renewed sense of purpose. I was reminded why I love what I do, and newly equipped with tools and knowledge to help me do it better. And in the end, that is what trade shows are all about. Can’t wait to do it all again this year in Baltimore, December 1st – 3rd!